It’s been a busy, busy weekend here in the MashupMom household — so we’re going with “quick & easy” as the theme of tonight’s recipe. 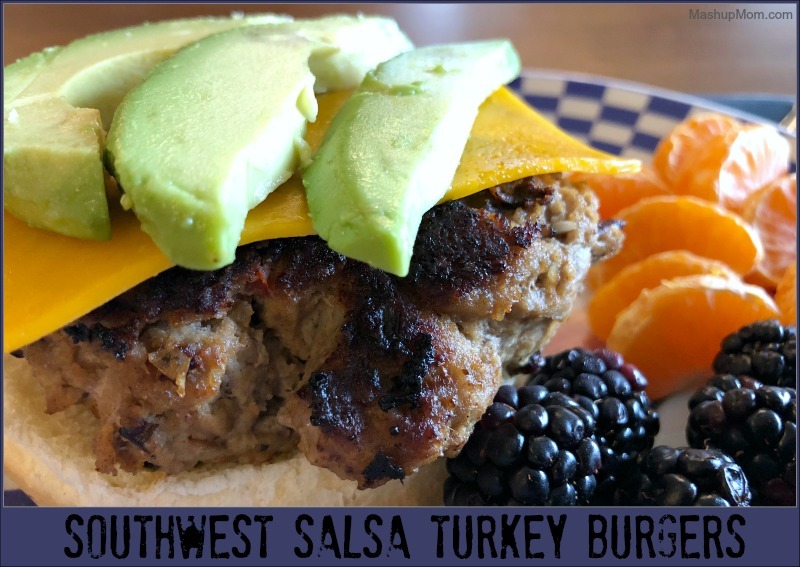 Read on if you are tired of dry turkey burgers and find yourself looking for a bit more of a kick, because these juicy and flavorful Southwest Salsa Turkey Burgers could be just the twist you’re looking for. 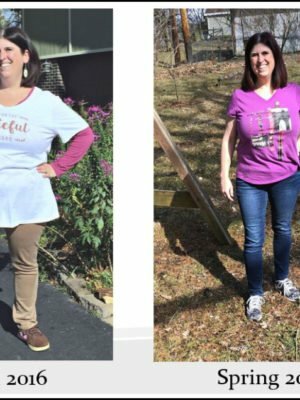 And, I’m not kidding about the quick & easy part! 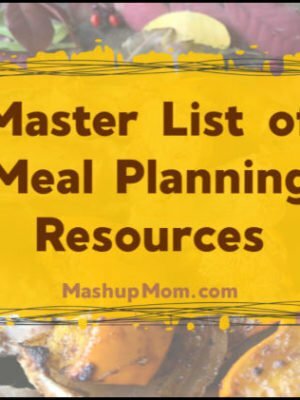 There’s almost no prep work involved here: You combine a few burger ingredients into patties, fry your salsa turkey burgers up in a pan, and you have yourself a simple 25 minute weeknight dinner. 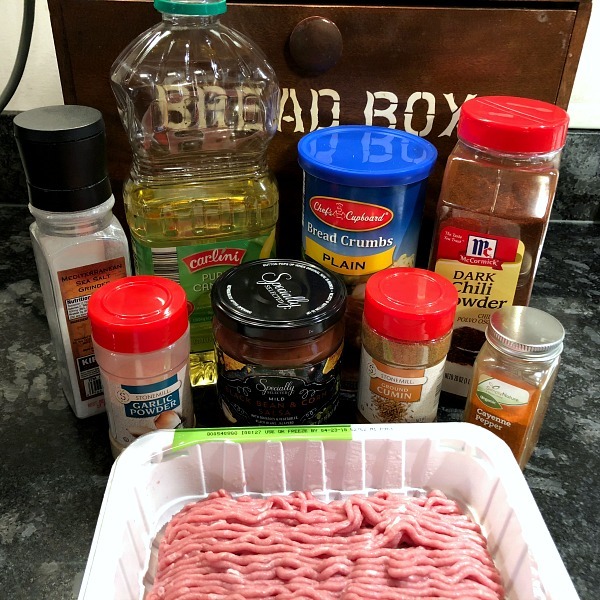 Ground turkey stars in this week’s edition of Sunday Scratchups: Your weekly recipe from scratch around grocery sales and affordable ingredients. 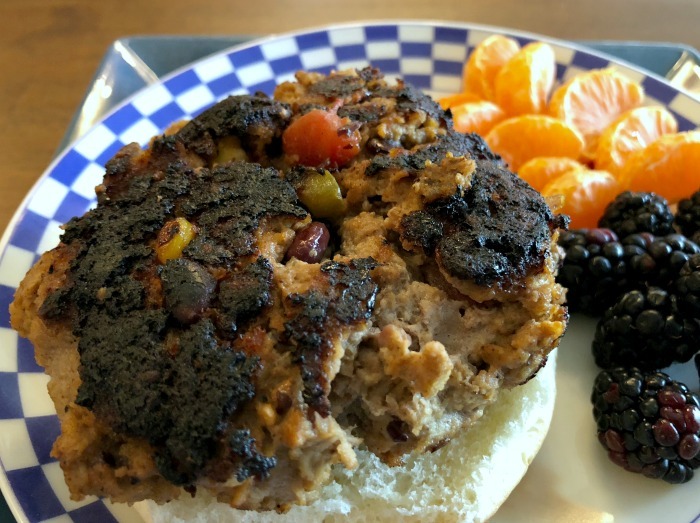 Just a few spices plus a little bit of black bean & corn salsa (mine here is from ALDI) is all you need to give these southwest salsa turkey burgers their robust flavor, and this is a great way to use up part of one of the larger packs of ground turkey that tend to go on sale more often. 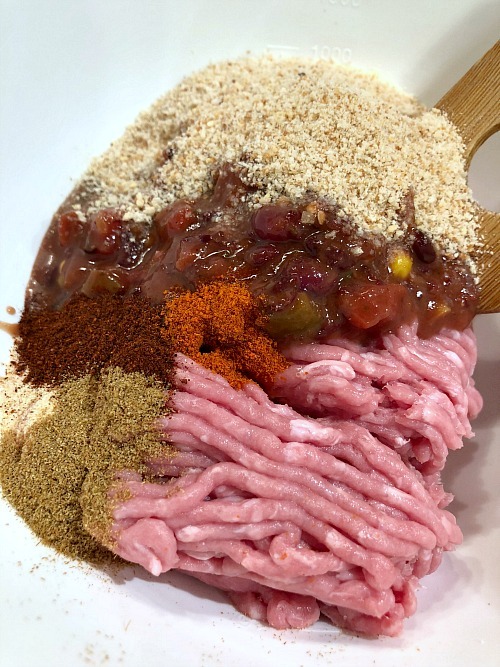 Combine all ingredients except the oil in a large bowl, then use your hands to form the turkey mixture into four large patties. Meanwhile, heat the oil in a large skillet over medium-high heat for about a minute, then swirl to coat the bottom of the pan. Add the turkey burger patties. 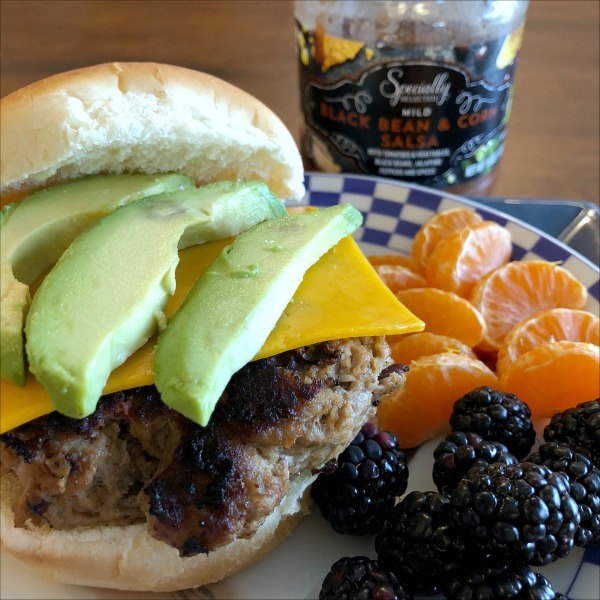 I served my burgers on buns with sliced avocado and cheddar to continue the Southwest theme, but you can mix things up with your own favorite burger toppings of choice. Note: These do fall apart fairly easily, so be careful when flipping the burgers and transferring them out of the pan — however, that doesn’t affect the taste! Cooking time depends on thickness; if you decide to make, say, six smaller & thinner burgers you should flip around 5 minutes rather than at 7. 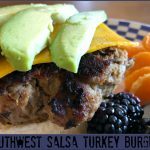 Give these moist & flavorful Southwest salsa turkey burgers a try the next time you’re looking for a different take on your basic burgers. Note that the black bean & corn salsa I used today is on the tamer side, so I spiced this batch of burgers up a bit more to match our tastes. 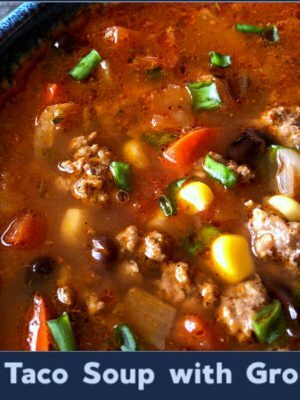 Omit the cayenne, however, if you are sensitive to spice or have little ones who won’t appreciate it — you can even add just the salsa and breadcrumbs if you’re looking for a little bit of that Southwest flavor, but want to keep the spice level very mild. 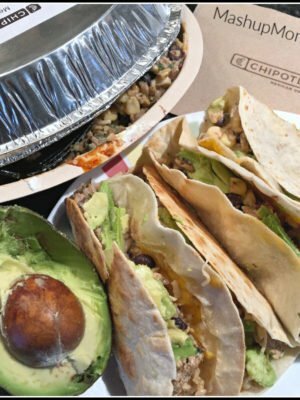 Slightly spicy, super satisfying -- Just omit the cayenne if you are sensitive to spice or have little ones who won't appreciate it. These do fall apart fairly easily, so be careful when flipping the burgers and transferring them out of the pan -- however, that doesn't affect the taste! Cooking time depends on thickness; if you decide to make, say, six smaller & thinner burgers you should flip around 5 minutes rather than at 7. A trick I learned from America’s Test Kitchen is to mix in a dollop of mayonnaise and use panko instead of regular bread crumbs. The burgers hold together better and have a great juiciness and crust. Such a great weeknight meal! 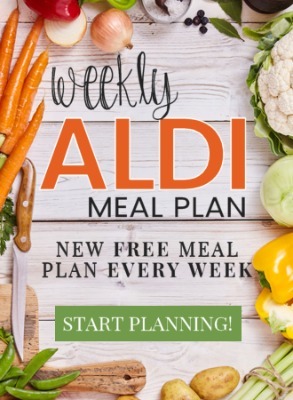 This was a great, easy meal! Our family loved it! We topped with a slice of cheddar and some avocado. Thank you!